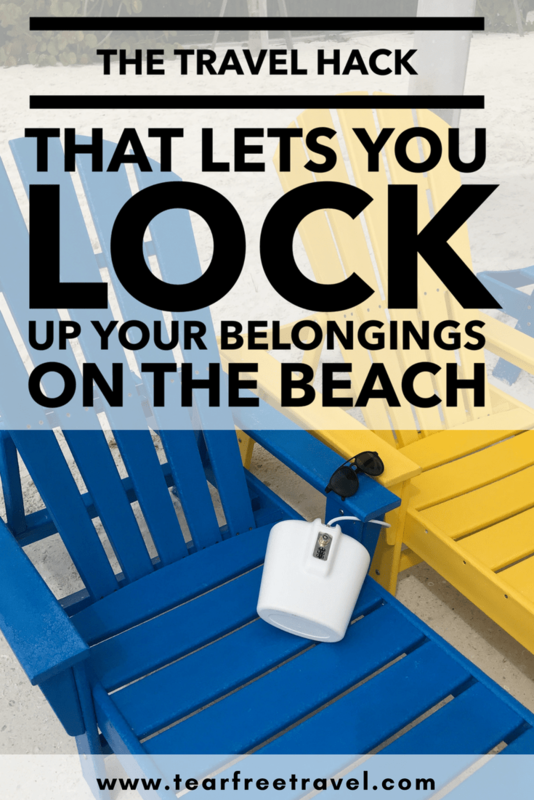 If you are wondering how to keep valuables safe at the beach, there is finally an awesome solution! For the longest time, I had been dreaming of a little beach safe for valuables I could carry along and I’ve now discovered this is a real thing!! 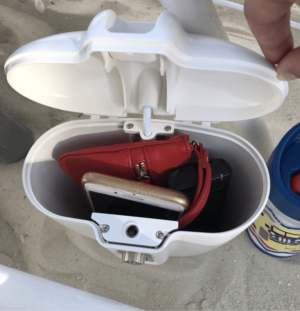 The safego portable safe is a portable safe for travel that latches to anything and keeps your valuables safe at the beach. No more running into the water with your wallet, keys and cell phone strapped to your neck! No one has to stay back and ‘watch the stuff’! I love it!! What is the Safego Portable Safe? The Safe-Go is a small portable safe that locks to a beach chair, stroller, bench, tree, (whatever!) that can hold your valuables. It fits two iPhones, two slim wallets and a basic point and shoot camera. You set your own four digit code to access the safe. There is a retractable cord that allows you to lock the safe to a variety of objects. I am pretty much obsessed with this product. I use it at the beach, and while lounging at the pool on vacation to keep my phone, room key and wallet safe. I love that I can go in the water and not have to worry about my stuff. I hate when one person has to stay behind to keep an eye on the belongings. It’s especially great when you have kids and are easily distracted and can’t really keep an eye on your stuff! I am discovering more uses for this thing all the time. Last week, I took my son to a museum and attached it to my stroller. Put my valuables in it and when my son was running around like a maniac looking at stuff, I didn’t have to be constantly worried that I didn’t have the stroller directly in my eye line. You can also use the safego to lock the stroller to a bench or pole, effectively using it as a stroller lock as well. 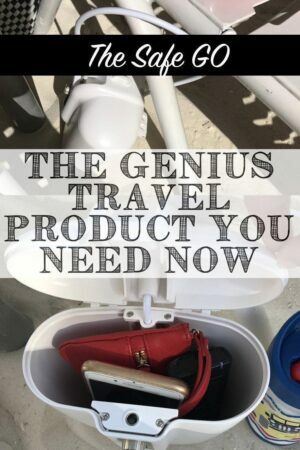 This product is great for families, but it’s just as handy for couples or any groups that are traveling. If you are staying in an Airbnb or hotel without a safe, you can also use this safe to lock up your passports and other valuables. Just lock it to a railing or cabinet in the house so it will stay put. There are a few other options for portable travel safes on the market. I haven’t used any of these personally so I can’t vouch for their quality. I always suggest reading Amazon reviews to see what other people think. This lock bag for valuables is a popular option on Amazon. The great feature of this safe is that it folds flat when it’s not in use. That is awesome for packing light when you are short on space. It is a soft bag that has a built-in steel wire mesh making it difficult for thieves to slash. This portable safe looks smaller and thinner than the safego. I don’t think it can hold as much stuff but its thin design is appealing for travel when space is tight. It also has a cord which allows it to be locked to chairs, benches and other fixed objects. Ok, this one is super cool! For those looking for a more discreet travel safe, this one is awesome. I could see throwing this in my bag and fooling all the pickpockets. It would also be great for passports in an Airbnb. This soft portable safe has a flap that will lock around a fixed object. I like the idea of locking around the clothes hanger in the closet, that is great for hotel room stays! Looking for some more space saving packing hacks for your next vacation? Check out my review of the best packing hacks for families here! « Finest Playa Mujeres: Our Super Detailed Review!